My 3rd grade class is always pretty small, so we usually start the year doing a Genius Hour project together so they can practice research and presentation skills. This year, my group of 4 decided they wanted to learn how the Great Barrier Reef has changed over time, and what are the consequences of these changes. They seemed to have a slightly vague idea of what the death of the reef could mean – especially for people who live on the other side of the world. I ran across an excellent site that allowed them to see immediate and long-term effects of pollution and other human interference with the reef. 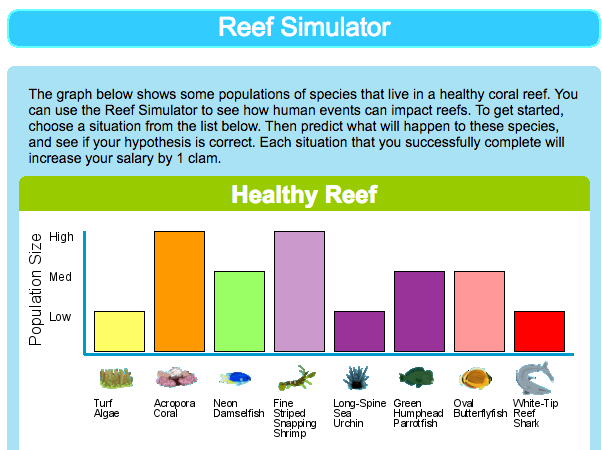 The “Reef Simulator” allows players to choose a scenario, such as overfishing or tourism, and develop a hypothesis for how some of the reef’s dependents will react. With a press of a button, the students can then see a bar graph that reflects short-term population changes due to the scenario, and another button to see the long-term changes. With a few multiple choice questions, the simulator determines how much understanding the users have of the graph, whether or not it supports their original hypothesis, and whether they want to change the hypothesis. Since we talk about “systems thinking” in my classroom, this simulator was an excellent interactive that allowed my students to see that changes in a system indirectly affect every single part of the system eventually. They were truly surprised how animals like certain breeds of sharks might become completely extinct without ever being hunted or directly targeted by humans. To follow this up, I plan to show them this TED Ed lesson next week. Click here to try the Reef Simulator tool.